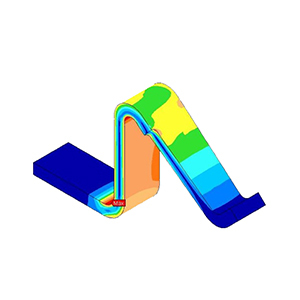 FEA-Solutions (UK) Ltd - Finite Element Analysis For Your Product Design | 421: Spring Clip Spring clip used to press electronic components onto heat sinks. Mechanical failure caused electronic malfunction. Although looking like a trivial stress problem at first glance, it was complex to find a compromise between compression force and spring rate. Deliverables included spreadsheet for client to calculate springs for future projects.